On October 10th 1994, Oasis released the 'Cigarettes & Alcohol' single. It reached number 7 on the official UK Singles Chart and has spent 79 weeks in the charts to date. On October 10th 1995 Oasis played at Hammerjacks in Baltimore, USA. 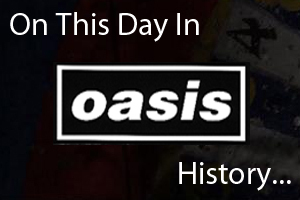 On October 10th 2001 Oasis played the first of two nights at the Apollo Theatre in Manchester, England. It was part of the six-date '10 Years Of Noise & Confusion' tour to mark the band's 10th anniversary. On October 10th 2008 Oasis played the first of two nights at the Arena in Sheffield, England.